These babies have taken me a couple of tries to perfect, hence the lack of posts in the last couple of weeks. The photos aren’t my best as they were taken in a little bit of a hurry on a late work night- but I think you can still see the pretty end result! Earl Grey is my favourite tea and I’ve been thinking about a way to incorporate it into a recipe for a while. The little apple cakes and sweet, tea-infused icing work to balance each other and make for a pretty morning tea or party treat. The tea flavour of course isn’t going to appeal to everyone but it’s something different and definitely worth a go if you are a fan of the Bergamot brew yourself. You could even swap it out for an English Breakfast or Darjeeling. I came up with two different looks for the toppings, and I think they both turned out nicely. 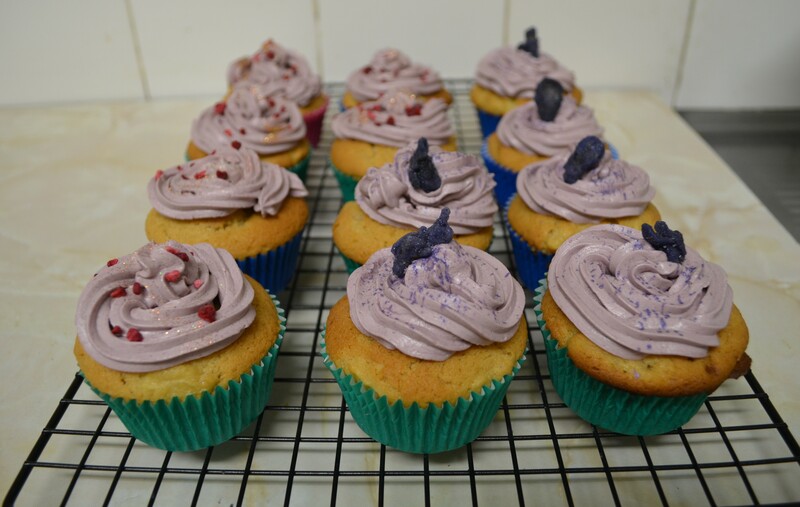 The icing is light and fluffy and pipes well- you can just as easily leave the food colouring out for a more simple look. 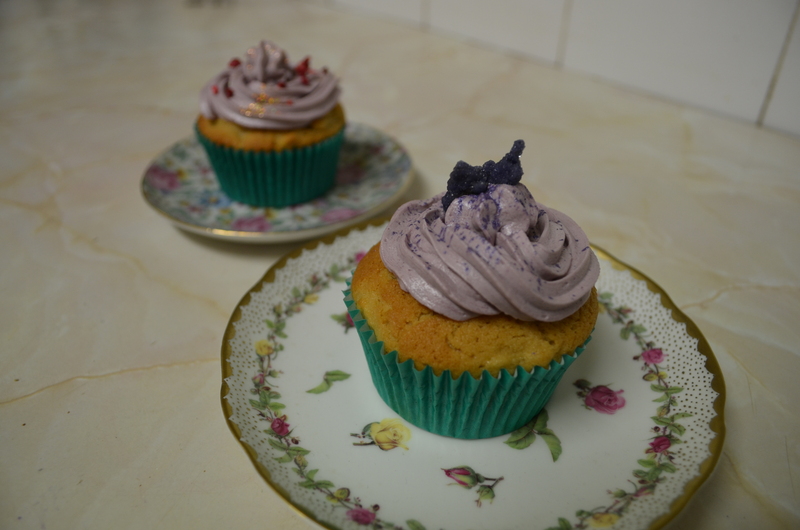 Next time I think I’ll try crushing the violets and combining them with the edible glitter- purple is the way to go and the violets are always well received my taste testers. Which decorations are your favourite- do you have any go to toppers like me and my violets? 1. 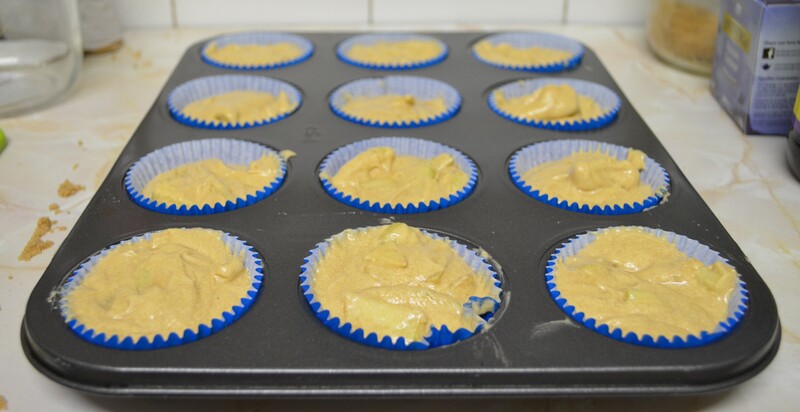 Preheat oven to 180°C and line a 12 hole muffin tray with muffin cases of your choice. 2. 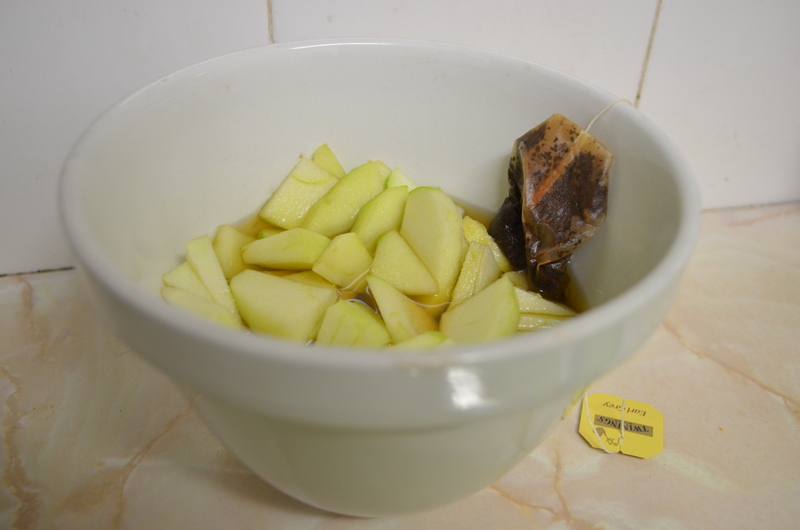 Place teabag and boiling water in a medium bowl and brew for recommended time. Add chopped apple and leave to soak for 5-10 minutes. 3. 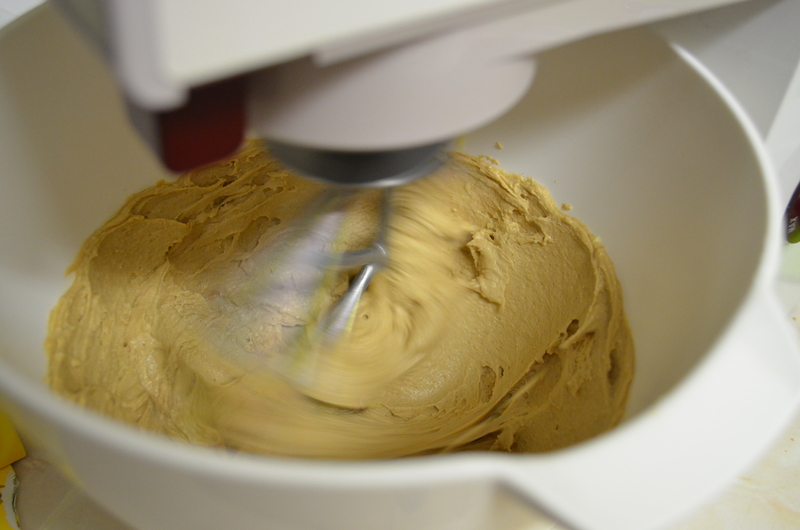 Using an electric mixer, mix egg, sugars and vanilla essence on medium speed until combined. Add butter and mix on high until the mixture is combined and slightly paler in colour. Add salt. 4. Add half the flour and mix on a low speed until combined, then add half of the milk. Repeat. 5. Drain apples and add to the mixture, folding in gently. 6. Spoon the finished mixture into the prepared cases, filling them to no more than 3/4 capacity. This is actually a shot of my first batch- they were slightly overfilled and I was left with mushroom top cupcakes- so be cautious, cooks! 7. Bake cakes for 15-20 minutes or until lightly browned. Cool in tray for 5 minutes and then move to wire cooling rack. 8. Meanwhile, prepare your Earl Grey icing. Microwave the milk in a small glass or ceramic bowl for 30 seconds on medium heat and then add your teabags and brew. Add a splash of boiling water if necessary to add a bit of heat. 9. Mix the butter on high for 1-2 minutes or until beginning to turn pale and fluffy. Reduce speed and gradually add icing sugar. 10. With the mixer on low, pour in the milk-tea brew, squeezing the bags to make sure you have enough flavour. Add a small amount of each food colouring and stir through, repeating until you have your desired colour. I was able to achieve a pale purple which I really liked the look of. 11. Mix the icing on high until you are satisfied that it is nice and light and fluffy- a few minutes should be long enough. 11. Using a fluted piping attachment, pipe the prepared icing onto the cooled cakes (I’m still perfecting my piping technique, but the texture of the icing is forgiving, and your decorations will help distract from any imperfections). 12. 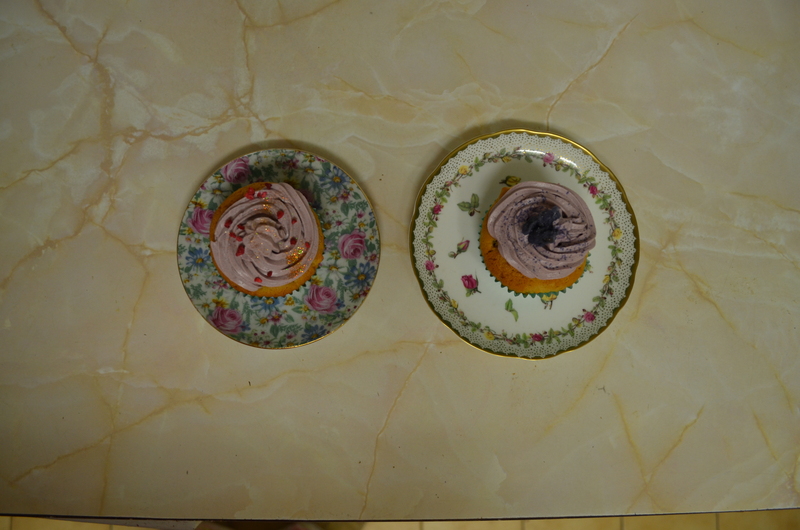 Decorate with your chosen toppers and serve on pretty floral plates! 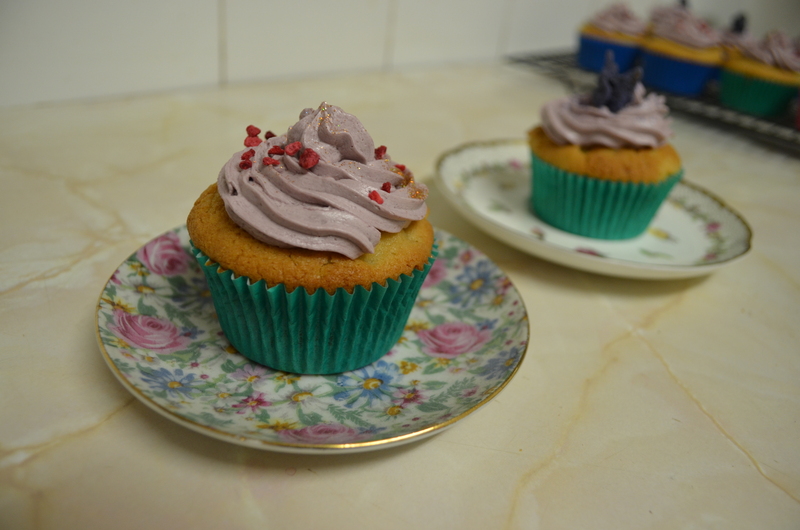 Let me know how you find this recipe- it’s one I’m quite happy with as it has taken some experimentation to get right!